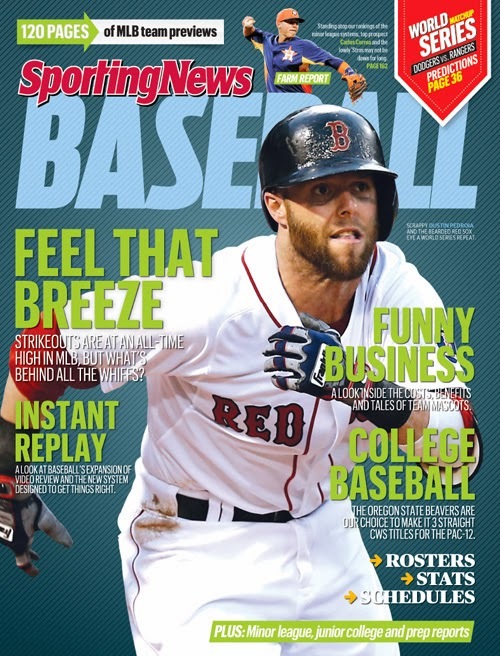 Two baseball preview magazines are on newsstands. 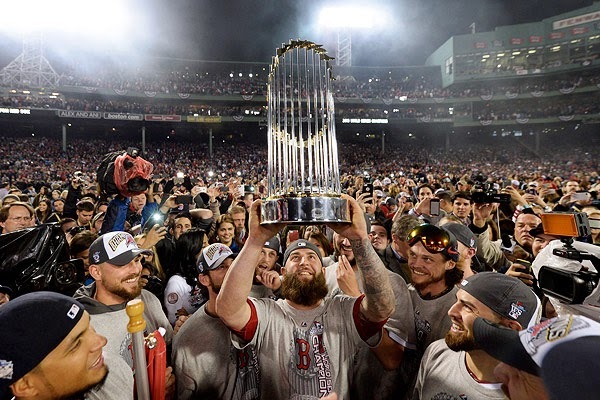 Boston: The Red Sox went from the A.L. east basement to World Series champs due to great chemistry and a resurgent pitching staff last year. They'll be big-time contenders for that title again. New York: Injuries and advancing age killed the Yankees last year and they still won 85 games in baseball's best division. Braced with several new additions, they should be playoff-bound again. Boston: Jacoby Ellsbury high-tailed it to the Bronx, but the Red Sox retained enough talent over the winter to make another serious run at the top. With youngsters Xander Bogaerts and Jackie Bradley joining the everyday lineup, the champs could be more dynamic than they were a year ago. Imagine that. Yankees: This is not a golden age for Yankees baseball. Robinson Cano left for greener pastures, the A-Rod circus clouds the present, and the future looks bleak because the farm system is bereft of talent. Most important for 2014, the Yankees lack the starting pitching to keep pace with the American League's heavyweights. Jerry Remy announced today that he will return to NESN and work alongside Don Orsillo in 2014. Remy left the booth in mid-August last year after his son was arrested for murder. The trial is not scheduled to begin until October. Remy made a lengthy statement before taking several questions. WEEI has posted the statement and the Q&A. I just want to be super sensitive to the Martel family with all of this because we do feel horrible for them. We just can't imagine what it's like, waking up every morning and not being able to be with your daughter who is a very, very special person. I have posted a 2,200-word excerpt from Don't Let Us Win Tonight: An Oral History of the 2004 Boston Red Sox's Impossible Playoff Run at the book's website. It's Sunday night, October 17, 2004. The Yankees have won the first three games of the American League Championship Series and they lead 4-3 in Game 4 at Fenway Park. It's the bottom of the ninth inning, and the Red Sox are three outs away from a long, cold winter. Kevin Millar is set to lead off against Yankees closer Mariano Rivera. Don't Let Us Win Tonight can be pre-ordered at Amazon (or other places). 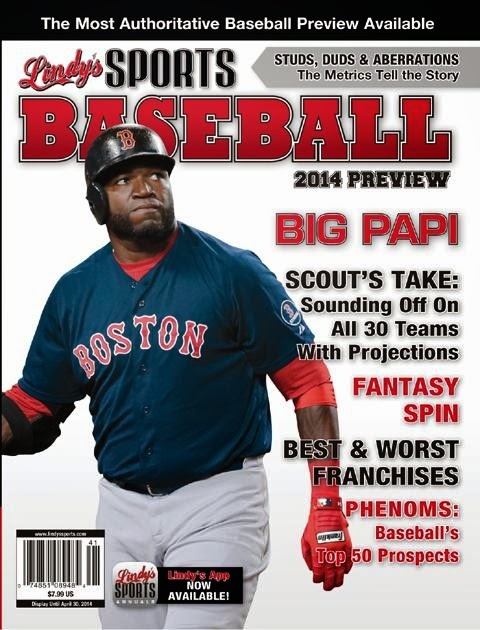 The book should be available around Opening Day. Two Weeks To Truck Day! The Red Sox's equipment truck will load up at Fenway Park on Saturday, February 8! Less than three weeks before players report to spring training, Jonny Gomes has already needled the Yankees and their extravagant winter expenditures. Gomes: "It's kind of interesting, though — $500 million and still some questions. You've got [free agent catcher Brian] McCann who hasn't been in the American League before, the pitcher [Masahiro Tanaka] who hasn't pitched a game over here. They've got some guys playing different positions. ... Kind of flattering a little bit, you know, that [a division] rival has to reload as much as they did. We lost some core players; at the same time, this organization is extremely deep. The majority of our core group of guys is back. We're champs. We have to uphold that title." Gomes also noted: No beards in 2014. Boston signed Grady Sizemore to a cheap one-year deal. Because of injuries, Sizemore has not played in a major league game since late 2011. Sizemore: "Who wouldn't want to be a part of this group of guys and this organization?" ... John Farrell answered a few questions about Sizemore. Jon Lester wants to stay with the Red Sox for the rest of his career, and he's willing to take a deep discount to do so. I want to be here until they have to rip this jersey off my back. I want to stay here. This is what I've known. I grew up in this organization. I've had plenty of good and bad times here. I enjoy it, my family loves it here, all my son talks about is going home to Boston, and that's what he thinks is home. If it all comes down to it, we want to be here. ... I want to win, and if that means taking a Dustin Pedroia deal, to take less money to be happy and competitive and win every year, let's do it. MLB.com released its Top 100 Prospects List - and Boston has nine players, the most of any organization. Xander Bogaerts is #2. This was posted at SoSH yesterday and is shared here just because. Derek Lowe, Curt Schilling, Pedro Martinez, Bronson Arroyo, and Tim Wakefield started 157 of Boston's 162 regular season games in 2004. The Yankees will have to finish in fifth place without Slappy McBluelips. Arbitrator Fredric Horowitz struck the 14-time All-Star and three-time Most Valuable Player with the 162-game suspension, plus the offseason, in an endorsement of MLB's accusations that Rodriguez scored an array of PEDs from Biogenesis, a now-shuttered Miami-area anti-aging clinic operated by Anthony Bosch, in clear violation of the game’s collectively bargained drug program. Now it looks likely that the 38-year-old third baseman will be near 40 by the time he is allowed back on the field, assuming his health allows him to return. The Yankees still owe him about $84 million -- minus the 2014 salary -- on a contract that doesn't expire for four and a half more seasons but Rodriguez has endured two hip surgeries in the last five years, including one last January, and is markedly diminished as a player. "Don't Let Us Win Tonight" Is Off To The Printer! Final edits and corrections have been made, photos have been selected and arranged, and the dust jacket copy has been approved! My book on the 2004 Red Sox postseason is now completely done (!!) and is being sent to the printer this afternoon. It remains on schedule for an April 1 release. The slightly-altered title: Don't Let Us Win Tonight: An Oral History of the 2004 Boston Red Sox's Impossible Playoff Run. I have set up a website for the book, which is pretty bare at the moment, as well as a Twitter account. You can pre-order DLUWT at Amazon, Barnes & Noble, and Powells, as well as through the publisher, Triumph Books. Best wishes to everyone for 2014!